The P&F Association plays an important role in working collaboratively with parents, students and staff in supporting and enhancing student experience of College life. Meetings are held once per month in the Adventure in Learning (AIL) room at 5:30pm. All parents/carers of students enrolled at the College are members of the P&F and are most welcome and encouraged to attend. Please feel free to forward any thoughts, ideas or correspondence to the P&F’s email address ua.ud1556272583e.dlq1556272583.csh@1556272583sdnei1556272583rfdna1556272583stner1556272583ap1556272583. We welcome your input through e-mail and hope this will become a valuable way to communicate with the P & F when unable to attend a meeting. If you require further information call the College Office on 4969 2600. 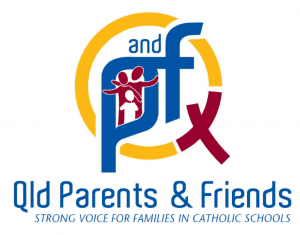 For further information on roles of P&F Associations and parent support visit The Federation of Parents and Friends Associations of Catholic Schools in QLD website www.pandf.org.au . As a means of encouraging and supporting student achievement, the P & F Association provides some financial assistance to students who are selected to compete at progressively higher levels in sporting or cultural competitions within the Mackay district and indeed to represent the College in other ways. To qualify for support, the student must have been selected through the College pathway, for example, through Capricornia Secondary School Sport or through a schools-based competition such as Opti-MINDS. Differing levels of financial support are offered for representation at Regional, State, and National competitions. Application forms are available from the College Finance Office and need to be submitted to the Principal, within the current year in which the student was selected and actually competed. Holy Spirit College and the HSC P&F Association are proud to provide SchoolTV – a digital Wellness Platform. The purpose of SchoolTV is to provide a single resource for Parents, (Students & Staff) covering a range of Wellness & Well-being topics, on a monthly basis. SchoolTV provides short, sharp & relevant Presentations from a selected range of leading experts & specialists and organisations, and can be viewed on any device. Content is based around the very real issues faced by Parents and today’s Youth, and is presented in a multi-media format. Some of Australia’s leading authorities, including Dr Michael Carr-Gregg, have joined together to develop a fresh approach to the distribution of key information and strategies to inform and empower today’s Parents and Youth. If you have any questions about the SchoolTV site, please contact ua.ud1556272583e.dlq1556272583.csh@1556272583aidem1556272583. Please take advantage of these wonderful SchoolTV resources!